Senator Darrell Steinberg’s new proposed spending plan for CA cap-and-trade revenue. Senate President Pro Tempore Darrell Steinberg (D-Sacramento) announced a proposed plan to create a permanent spending strategy for cap-and-trade revenue [PDF] that prioritizes investments in affordable transit-oriented housing, transit expansion, and CA high-speed rail. Unlike the Governor’s plan for this year’s budget, Senate Bill 1156 also proposes investments in “complete streets” and transit operations. Calling the plan a “long-term investment strategy in greenhouse gas emissions,” Steinberg said he wanted to spark a “healthy debate” about how the state should spend the revenue collected via the state’s cap-and-trade system created under A.B. 32, California’s Global Warming Solutions Act. “This strategy is designed to achieve the objectives of A.B. 32 through significant reductions in greenhouse gas and the direction of public and private investment to California’s low-income and disadvantaged communities, which are disproportionately burdened by air pollution and the effects of climate change,” Steinberg said in a press release. Steinberg’s staff emphasized that the plan provides a permanent funding stream for affordable, transit-oriented housing and mass transit, which are key to reaching the goals of A.B. 32 yet lack stable sources of funding. The proposal replaces a bill Steinberg introduced in February to replace cap-and-trade with a carbon tax. Steinberg acknowledged that the carbon tax proposal was “not that popular,” and said that the current proposal was a product of the debate provoked by the earlier bill. A.B. 32 requires California to reduce greenhouse gas emissions to 1990 levels by the year 2020, and calls for the California Air Resources Board to create a market system for helping achieve those reductions. In response, CARB created a cap on emissions from GHG producers and an auction system to allow those who don’t meet the cap to buy emission “credits” from those who do. This cap-and-trade system currently applies to the state’s manufacturing sector, and is scheduled to include fuel producers next year. Meanwhile, the auctions are producing revenue, which by law must be spent on further reducing GHG emissions to help California reach A.B. 32’s the goals. Steinberg’s proposal was well-received by transit advocates. “While there is work to be done in the weeks ahead, and some aspects of the proposal need improvement, Senator Steinberg has made a clear commitment to provide a much needed boost in funding to meet both California’s growing demand for real transportation and housing choices while meeting our greenhouse gas reduction targets,” wrote TransForm’s Ryan Wiggins in a blog post. Governor Jerry Brown’s proposed cap-and-trade expenditure plan, currently being discussed by legislators, proposes spending 70 percent of the revenue on transportation-related projects and programs, with more than a third of that amount for high-speed rail. None of the funds would go towards bicycle and pedestrian infrastructure or bus transit. 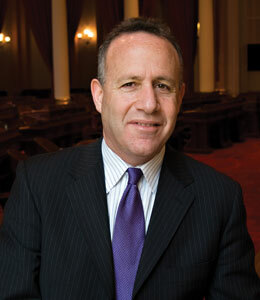 Steinberg emphasized the importance of helping disadvantaged and low-income communities contribute to GHG reductions. His proposal would require that all investments considered be ranked according to effectiveness in reducing GHGs. Encouraging more development in high transit areas is generally good, though I’m not quite sure why we need to spend money on this. Seems like developers would be happy to build in these areas. And I’m all for affordable housing, but I’m not sure how that contributes to GHG reductions directly. This sounds a bit like it’s a big giveaway to subsidize developers to build stuff they were already going to and pay them off to include some mid-price housing frankly. But maybe I don’t get the goal here. They would be happy to build in these areas, unfortunatly those areas have been doing all they can to block it. “High transit area” is a completely meaningless term. It is a way for greenwashing sprawl development, and sports arenas (with huge parking lots). Yes. But is throwing money at the problem going to change that? $1.7 billion/year toward housing subsidies is highly questionable, especially if it’s if leiu of CEQA and zoning reform. How many of these subsidized units will feature a costly two car garage due to high parking requirements in a development that took 3 years to permit and was scaled down due to potential traffic impacts? I would much rather reduce the cost of development and put that money into transit and complete streets. We should seek to expand the supply of locations that are walkable and transit-accessible and alleviate the pressures of gentrification that occur just because there’s a rail line or some bike lanes. It seems like we’re digging ourselves into a bigger hole rather than proactively addressing the problem. SB 743 should clear up some of our CEQA obstacles. Complete streets should certainly be invested in, but I don’t think people will ride their bikes across multiple cities to get to work and back just because there are bike lanes. Effective transit coupled with walkability would be used by more people to reduce GHG. We need immediate investment in housing near transit to reduce driving, meanwhile we can fill out our transit system to meet the suburbs. The California Department of Motor Vehicles (DMV) collects $billions$ using “Wallet Flushing” car tax. Is it time for CA AG Kamala Harris EPA GMO ethanol fuel waiver conversation? Did Governor Brown choose a CA/DCA/BAR Chief who can find out if what is broken on a PZEV Smog Check failed car gets fixed? A Smog Check secret shopper audit would cut toxic car fleet impact 1500 tons per day while reducing cost by $billions. Could someone post a detailed comparison of these numbers to the numbers from Jerry Brown’s plan? The link here just goes to the whole state budget, and I’m having trouble even finding mention of the cap and trade money there. 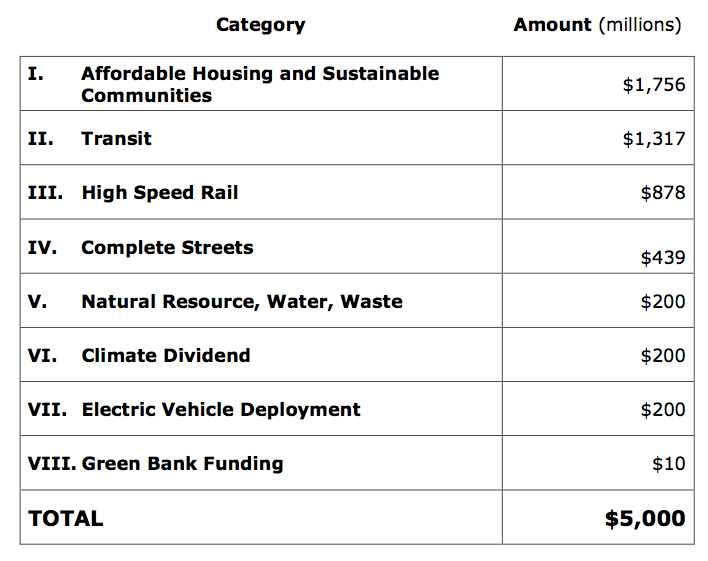 Comparing this to the earlier Streetsblog discussion, it looks like both plans put about 15% of the money towards high-speed rail, though perhaps I’m adding incorrectly. They should take all the money for affordable housing and use it to build transit instead. You can have all the housing you want around transit stops.. but if the transit network is not dense enough to take people where the need/want to go, then they will use cars.. and your increased density will actually make traffic congestion worse. 1) Energy efficiency. I suspect that this plan somehow supports this but it’s not clear. With not all that much effort or investment, Californians could get by with half the energy per household they currently use through reasonable insulation, getting rid of the old refrigerator in the garage that predominantly hold beer and soda pop (25% of all households), replacing standard air conditioners and most forms of electric heat with air-sourced heat pumps, reducing vampire load, using LED bulbs, replacing all refrigerators over ten years old with energy efficient models, etc. There needs to be a second refrigerator amnesty–would cut 10% of California’s electricity use overnight. 2) Encourage housing where people can bike and walk to shops and services and walk, bike, or take transit to work. This means density, it also means mixed use development and making it safe to bike and walk. Three fourths of all trips made are *not* commute trips. The thinking has to extend beyond just people getting to and from work. 3) California needs to start encouraging landlords to invest in energy efficiency and, where it makes sense, green energy. Rental property should have to pass blower door tests to make sure the unit is adequately weather-stripped (not drafty), and walls and attics should be insulated to near current construction requirements. Very shortly almost all of our housing stock is going to need to transition to heat pumps for space heating, so might as well get that started with the rental stock. And while not all rental properties can produce enough solar energy on their rooftops to power a multi-unit apartment, most can probably produce enough hot water via solar and most can produce at least some PV. 4) Palm oil. Leads to massive deforestation and can be found in much US processed food. It’s also not all that good for you. If California were to ban sale of foods with made with deforestation palm oil, it would change some very critical land use world-wide quite quickly. 5) Ethanol. Total energetic scam (it takes more energy to create than it produces) that uses up lots of farmland that should be growing actual food. If California were to ban gasoline with ethanol that would be amazing. Of course this would be in direct contradiction to federal law, but that hasn’t always stopped California from doing the right thing. 6) Rail. While we are wringing our hands over high speed rail, we could quietly and fairly cheaply improve the tracks and route that exist between Oakland and LA and work with Amtrak to drop the travel time for the 400 miles from 12 hours to 4. Making rail faster than driving will do a lot. 7) Allow dense cities like San Francisco to charge curbside parking permits at market rates rather than force cities to subsidize private car storage as the state now requires. 8) To increase pedestrian and bicyclist safety: suspend driver’s licenses 30 – 90 days as the penalty for reckless driving. Suspend license for 180 days if you hit someone due to driver inattention/stupidity/negligence. Impound car 180 days for driving with suspended or no license. Impound car permanently for DUI. Would be far more effective than point, fines, or jail time. Seriously. California actually doesn’t have nearly as much of an “insulation” issue as most of the country, due to the extremely mild and stable climate. Insulation is a huge win in NY, not so much in California. As for improving the route from Oakland to LA to 4 hours? The only way to do it is to build high speed rail in the Central Valley. This has been studied repeatedly. The Coast Route which Amtrak currently takes is just too twisty and fully of mountains to get it down to anywhere near 4 hours. Agree with the rest of this. It’s hard to believe, but most houses in San Francisco built before the 80’s or so have no insulation at all. We dropped our natural gas bill by two-thirds by sealing (not just insulating) our attic and by blowing insulation in our walls. If you’re paying more than $50 a month for natural gas, you’re paying too much. Also some Californians live where there’s snow, and homes with insulated walls keep cool in as well as heat, resulting in the need for much less air conditioning in the summer. Californians do use less energy for space heating than the residents of most other states, but the odds are high they are going to have to use even less. I would love to see high speed rail in California, but at this point, we’re running out of time. The financial tsunami that didn’t get resolved in 2008 is almost upon us again, and the pretend FED money being pumped into the economy will turn out to be useless for buying real things. Improving the rail lines we have are our best bet. A tunnel here or there on the coast route will likely be what we have to do. Maybe in 2030 or so our energy situation and our economy will have sorted itself out and real high speed rail can be attempted in earnest.